Usage - Bedspread. 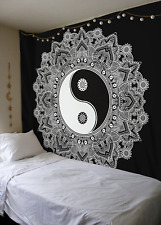 Item - Twin Wall Hanging / Tapestry / Bed Cover. Wall Hanging. Bed Cover. Material - 100% Cotton Fabric. Coverlet Or Sofa Cover. Table Cloth . Hand Embroidered and mirrored. Beautiful Elephant Wall Hanging. You are buying a wall hanging as shown in the pictures. and has ma d e the colours appear different than they are. But this is not automatic. Usage - Bedspread. Item - Twin Wall Hanging / Tapestry / Bed Cover. Wall Hanging. Bed Cover. Material - 100% Cotton Fabric. Colors - Green. Coverlet Or Sofa Cover. Table Cloth . 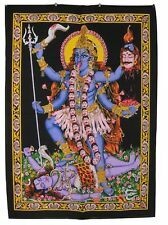 Really lovely wall hanging depicting the image of Kali. Beautiful Sequined Wall Hanging. Size 80 x 110 cm. You are buying a wall hanging as shown in the pictures. This is a Fair Trade item. A wonderful bright coloured item that is a real talking piece. Ganesh Design . Really lovely wall hanging depicting the image of Ganesh. Beautiful Sequined Wall Hanging. You are buying the wall hanging as in the pictures. This is a Fair Trade item. A wonderful bright coloured item that is a real talking piece. Hand embroidered and mirrored. Beautiful Embroidered Wall Hanging. You are buying the wall hanging in the picture. and has ma d e the colours appear different than they are. But this is not automatic. Hand made dream catcher decoration. Made from synthetic suede, beads and feathers. This beautiful starfish piece of wall art has been attractively decorated with found driftwood pieces. Due to the nature of the materials used each one of these pieces is unique, the skill of the artist is in their ability to assemble the mosaic of driftwood pieces together. Hathi Sawari Design . Really lovely wall hanging depicting an image of a Hathi Sawari. Beautiful Sequined Wall Hanging. This is a Fair Trade item. A wonderful bright coloured item that is a real talking piece. Maharajah Design . Really lovely wall hanging depicting the image of the Maharajah. Beautiful Sequined Wall Hanging. This is a Fair Trade item. A wonderful bright coloured item that is a real talking piece. You can also machine wash the tapestry in cold wash. Elephant Statue. Wall Hanging. Made from 100% Cotton. ENDING SOON. NEW ARRIVALS. ADD US TO YOUR FAVORITES. Cusion Covers. Beautiful Chakra Wall Hanging. Depicts chakra symbols on a black background. Made from Rayon and has a soft, silky feel. The hem is looped at the top so that you can insert a pole of your choice for hanging. Beautiful Om Wall Hanging. This is a characteristic of the item. love it! Size approx. You are buying the wall hanging in the picture. The picture has been taken using digital photography. Beautiful Runner Sari Patchwork Wall Hanging. Embroidered and Sequined Sari Pieces. You are buying the wall hanging in the pictures. This is a characteristic of the item. love it! Ganesh Design . Really lovely wall hanging depicting the image of Ganesh. Beautiful Sequined Wall Hanging. You are buying a wall hanging as shown in the picture. This is a Fair Trade item. A wonderful bright coloured item that is a real talking piece. These very unusual flower wall art plaques have been hand made in Bali. Krishna Design . Really lovely wall hanging depicting the image of Krishna. You are buying wall hanging as shown in the pictures. Size approx. 56cm x 74cm. Lord Balaji Design . Really lovely wall hanging depicting the image of Lord Balaji. Beautiful Sequined Wall Hanging. This is a Fair Trade item. A wonderful bright coloured item that is a real talking piece. Beautiful Sequined Wall Hanging. Really lovely wall hanging depicting the image of Buddha. Buddha Design . You are buying a wall hanging as pictured. This is a Fair Trade item. A wonderful bright coloured item that is a real talking piece. 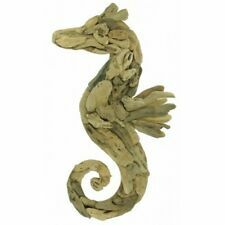 This beautiful dolphin piece of wall art has been attractively decorated with found driftwood pieces. Due to the nature of the materials used each one of these pieces is unique, the skill of the artist is in their ability to assemble the mosaic of driftwood pieces together. Radha Krishna Design . Really lovely wall hanging depicting the image of Radha Krishna. Beautiful Sequined Wall Hanging. You are buying a wall hanging as shown in the picture. This is a Fair Trade item. Length of the wooden section 100 cm, overall length including hanging string approx 120 cm. Create your own sign by painting on your own text and hang them for your pleasure. Due to the nature of the materials used each piece is unique and sizes vary, Approximate length 30 cm. Create your own room or garden sign or just hang as they are. Beautiful Ganesh Batik Wall Hanging. This is a characteristic of the item. love it! Size approx. You are buying the wall hanging in the picture. The picture has been taken using digital photography. Radha Krishna Design . Really lovely wall hanging depicting the image of Radha Krishna. You are buying wall hanging as shown in the pictures. Size approx. 55cm x 78cm. Mandala Bed Cover. Indian Mandala Tapestry. Bohemian Bedroom. Bohemian Bedroom. Indian Mandala Tapestry. Dorm Room Wall Hanging. Queen Mandala Bed Cover. Indian Mandala Tapestry. Dorm Room Wall Hanging. Reversible Hobo Bag. Mandala Beach Bag. Cotton Shopping Bag. Hippie purse. 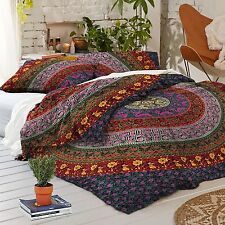 Mandala Bed Cover. Indian Mandala Tapestry. Dorm Room Wall Hanging. 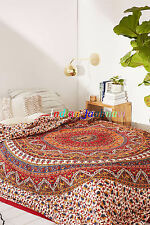 Mandala Bed Cover.. Indian Mandala Tapestry. Dorm Room Wall Hanging. Dorm Room Bed Cover. Indian Mandala Tapestry. Dorm Room Wall Hanging.